My birthday was in March, but Bülent “gave” me my present a few days ago. We flew to Antalya for the weekend! It was a whirlwind trip but we enjoyed ever minute of it. We flew in Friday night and visited my sister-in-law, who recently got engaged. It gave us a chance to meet her fiancé before the wedding in September. Saturday morning we left the city of Antalya for what has to be one of the most scenic drives in Turkey, full of cliffs, rocky beaches and dazzling blue sea. 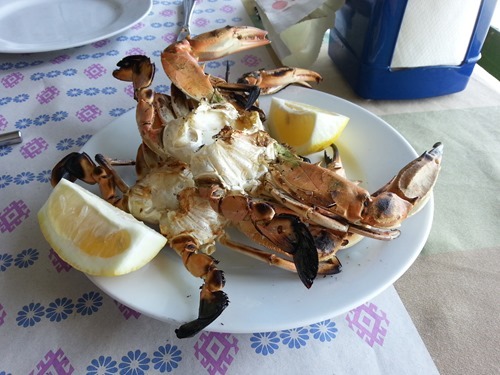 This area is one of the only places in Turkey you can get blue crab, so for lunch we stopped at a seaside restaurant. We followed the coast to Demre, and then climbed up into the mountains. Bülent surprised me with a night in a gorgeous B&B. 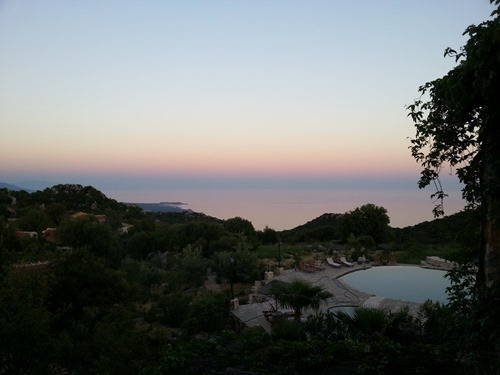 High up in the mountains, with a view of the sea, it felt like a different world. The hotel, Hoyran Wedre, is in a remote, small köy. Its grounds were scented with with rosemary, thyme and sage which were planted all over the place. 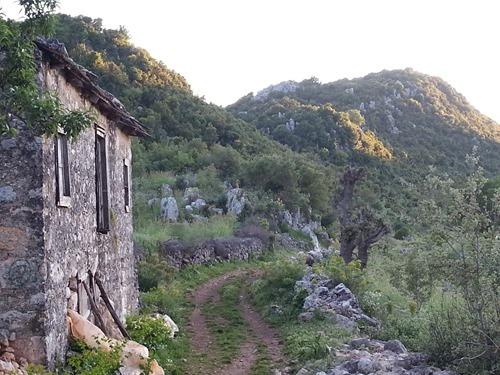 The hotel is actually located right on the Lycian Way, so we hiked part of it that afternoon, and the next morning. As if we could resist. It wasn’t hard to navigate, along the trail of the Lycian Way there are red and white tags showing the way. The village of Hoyran is very isolated and remote, with a very long history. Over time, many tribes and cultures migrated through this area which created an complex linguistic situation. The villagers have their own dialect, as well as Turkish. Their language is a mix of an accent and a dialect, and while some things are understandable, and others are not. The scenery was amazing. 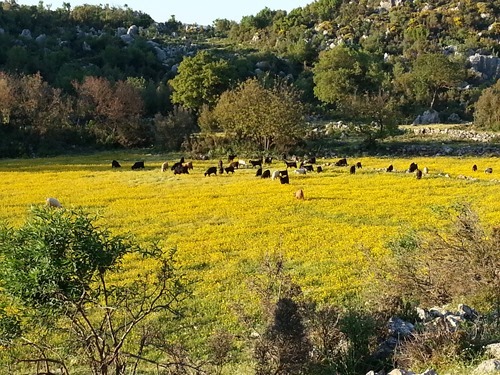 Yes, these goats are actually eating a field of flowers. We met the shepherd, who told us that some days he walks 30 km herding his sheep. Though he assured us that the goats didn’t need him to find their way, his job is to keep away the wolves and keep them out of fields. He told us about Antalya’s flora, boasting that his goats’ milk and meat was especially tasty due to their diet of wild herbs. He quoted an old saying,“Antalya’nın taşı toprağı altın” (Antalya’s rocks and soil are golden). We were informed that during his military service he traveled all over Turkey and never saw anywhere that rivaled Antalya’s fertile land or botanic diversity. 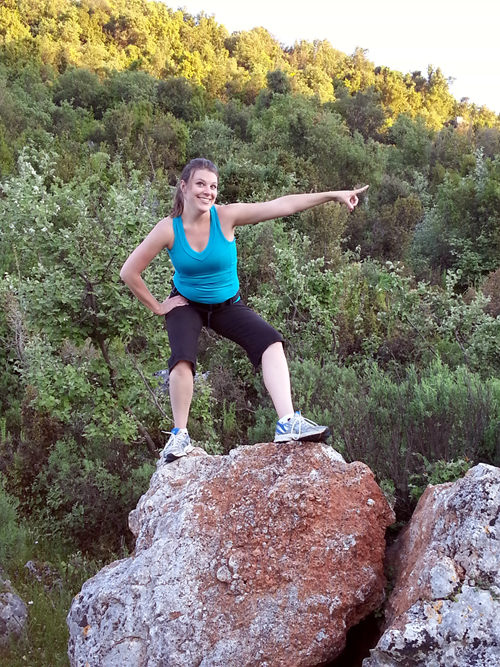 We had a great time talking to the locals and hiking in search of ancient ruins. 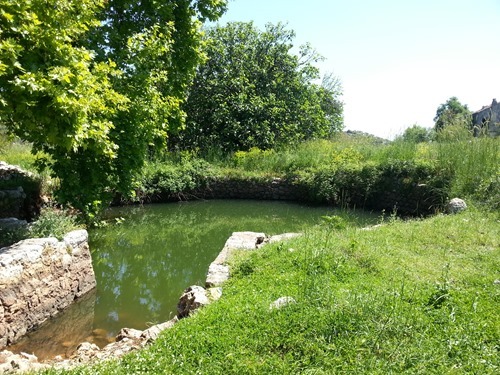 We didn’t have to look too hard for this cistern, it is right on the village road. It was an amazing birthday present, and very memorable for my last birthday of my twenties. The area was so scenic and beautiful I felt rested just being there. 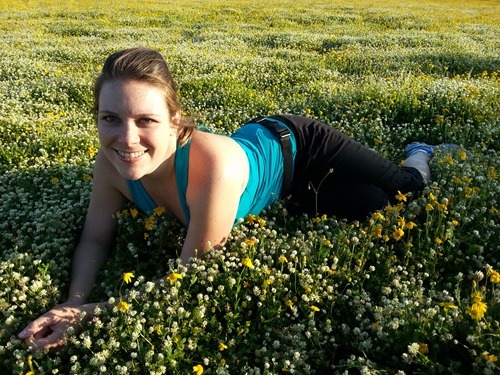 This entry was posted in Antalya, Bülent, Birthday, Lycian Way and tagged Antalya, Demre, Expat, Lycian Way, Turkey by Jules. Bookmark the permalink. Wow – it sounds amazing!